Let's just say that we don't have quite as many folks in the office as we used to. Empty offices and vacant cubes provide only the echoes of a workplace that used to buzz with activity. 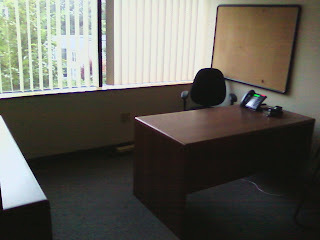 A friend who left the company before the worst of the recession hit used to sit at the desk in this photo. He's working elsewhere, thankfully, but his old office space remains dormant and vacant, just a shell with a desk and a window. I'm not sure what happened to the lawyer who had a practice next door to our office, but he and his receptionist are obviously gone now. 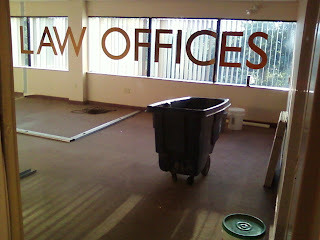 This space has been vacant for months; the words "law offices" on the front window are the only reminder that there used to be a workplace jammed with files, books and computer equipment. I'm sure that the proprietor of the building has been trying to rent this space for a while now...but it sits empty. It might for a while yet to come. 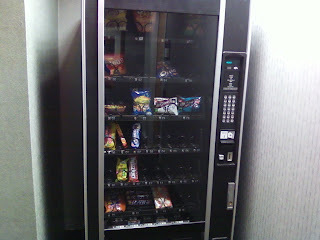 The candy machine in the hallway used to be our savior from hunger around 3pm every day. It stayed well-stocked and did a brisk business in better times. It's mostly empty now--not because there's so much demand for the candy but because nobody has bothered to come refill the machine with so few potential customers working on our floor. What's in there now has been in there for a while and will likely stay there for a while. Nobody wants to spend 85 cents on a Butterfinger anymore or fork over a buck for microwave popcorn. And there aren't many people left to fork over the buck, anyway. About 6:30 on a Thursday afternoon in August--a bit late to leave the office, sure, especially in the summertime. But I've been working in this building since February 2006, and many have been the times over the years that I've left work on a summer evening at 6:30 or later (sometimes much later) and found other people's cars still waiting in the parking lot for their owners. Not tonight. And not lately--not for a while. The silver car in the photo is mine, the last in the front lot waiting to be driven home. 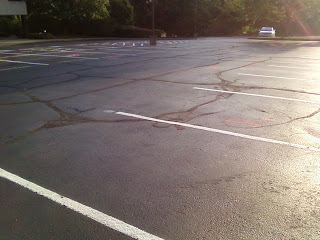 While there were a few stragglers still parked around back of the building, the front lot was a ghost town. That was never the case until about February or March of this year; before the economy tanked, there were always cars parked out front when I left work unless I left extremely late--say after 9 or 10pm. For some reason, this is the most disconcerting photo of the set for me. It's stark and empty, and that's kind of how the whole building feels now. I never thought I'd be wistful for a half-full parking lot, or a lot with four or five cars left in it at 6:30 on a summer afternoon. But when I think of the drivers of those cars that aren't there, I wonder what those people are doing and how they're getting by. And I'm thankful that my car is still in the lot.